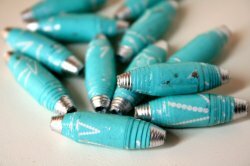 Hand rolled paper beads in beautiful light blue shade with silver accent. These paper beads are made from recycled magazines and catalogs. Each bead is unique.